First Recording: Harry Reser (banjoist) and band on Oct 24th, 1934 with Tom Stacks featuring on vocals. First Performance: November 1934 on Eddie Cantor's radio show. It became an instant hit with over 400,000 copies of sheet music sold by Christmas. Featured Artists: The Coundown Kids from their album - Santa Claus Is Coming To Town . He knows if you've been bad or good___So be good for good-ness sake__ Oh! The song is in the key of B♭ Major which requires a few barre chords. To make the song easy for everyone, we will be using a capo on the 1st fret and play in the key of A Major. There are a few barre chords in A Major, but they are easy ones. Beginners may find this a little testing, but stick with it ... it's well-worth the effort. The fermata or pause symbol means you hold the note for a duration which is determined by the performer. On the last bar of the Intro you strum the chord and hold it for the duration of the bar. At the end of the song, you strum the chord and hold it... let it ring out. The tempo is set at 84 bpm in half-note or minim time ... beat sounds on every 2nd beat (1 & 3) if you are using a metronome or click track. You can set the metronome at 168 bpm to play on every beat, but it sounds a little busy... the choice is yours. 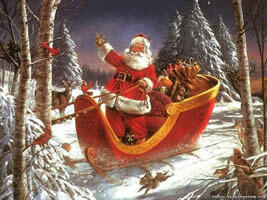 "Santa Claus Is Coming To Town" chords and lyrics are provided for educational purposes and personal use only.